Digest Gold represents the most effective enzyme formula on the market, with enzymes for protein, fat, carbohydrate and fiber digestion. Formulated with synergistic ingredients to promote optimal digestion, one capsule of Digest Gold per meal is typically sufficient to address common digestive complaints. Featuring Enzymedica’s Thera-blend technology, the enzymes in Digest Gold are effective throughout the entire digestive system, ensuring complete digestion. In laboratory tests evaluating digestive efficiency and time, Enzymedica’s Thera-blend proved 3X stronger and 6X faster than competing products, providing speedy support for digestive discomfort. America’s best-selling digestive enzyme formula is now supercharged with ATPro technology, Enzymedica’s exclusive blend of critical nutrients that provide ATP and enhance ATP production. A proprietary combination of ATP, CoQ10, Magnesium Citrate and Alpha Lipoic Acid, promotes nutrient absorption, improves HCl availability and decreases the energy demand of digestive processes. Enzymedica’s Digest Gold now contains 300,000,000 LCUs of ATP per capsule. A combination of aging, exercise, and eating cooked and processed foods can significantly increase the demand to produce large amounts of ATP, thus making it difficult for the body to keep up. As a consequence, even those living a relatively healthy lifestyle may be challenged with a constant state of energy deficiency. A digestive supplement providing ATP and enhancing ATP production may help offset such a deficiency. 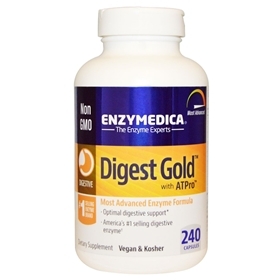 Combining a full spectrum of digestive enzymes with ATPro, Digest Gold offers unsurpassed digestive support—the most potent digestive enzyme formula on the market. A good choice for people who are lipase deficient. Digest Gold ATPro contains 4000 FCCFIP (active units) of the enzyme lipase per capsule. High potency protease, lipase, amylase and cellulose enzymes support protein, fat, starch and fiber digestion. Contains 4 more enzymes and is approximately 2 times stronger than Enzymedica Digest in most categories. Includes 4000 FCCFIP (active units) lipase, making it a good choice for individuals with gallbladder concerns or who are lipase deficient. Ideal for anyone suffering from health issues not necessarily associated with digestion. this is the best enzyme i have ever taken, period.